Many Taiwanese organizations and the PCT Church and Society Committee convened at Tang Teh-chang Memorial Park on March 10 to remember the life and legacy of Tang Te-chang, a lawyer who was executed by shooting on March 13, 1947 during the February 28 Massacre. The PCT christened the service “Taiwanese Hero Tang Teh-chang Memorial Service” and it was held on the very same spot where Tang had died more than half a century ago. Participating organizations urged the city government to remove the bronze statue of Sun Yat-sen from this park and to designate March 13 as a new holiday in memory of Tang. They hoped that when they returned to this park by this time next year, Tang would finally be the well-deserved focus of the park. The memorial service included a prayer for those who had perished during the February 28 Massacre and a song presentation by Tai-Peng-Keng Presbyterian Church Choir. 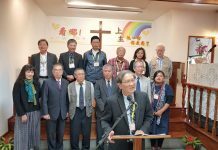 Tainan City Loves Taiwan Association CEO, Rev. Huang Te-cheng, delivered a short address wherein he reminded his audience that the PCT continues to support the idea that “Taiwan must become a new and independent country”. He explained that becoming an independent country was the best way to avoid another incident like the February 28 Massacre. Tainan City Mayor William Lai and Deputy Mayor Yen Chun-tzuo also attended this memorial service. The mayor said that it isn’t enough to remember the life and legacy of Tang, for it’s even more important to ensure that this tragedy never happens again. He said that he understood people’s desire to keep alive Tang’s legacy of protecting democracy and respecting human rights. Hence, Lai promised to come up with a way to achieve this and assured that he would present his ideas to the public in the near future. Taiwan Teacher’s Alliance arranged for a young boy from Dawan Elementary School to recite a Taiwanese poem penned by contemporary Taiwanese poet Chen Cheng-hsiung during the service as a way of honoring Tang Teh-chang. 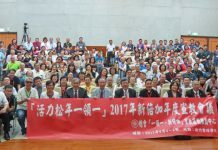 The alliance’s General Secretary, Kuo Yan-lin, said that this presentation carried symbolic significance because it underscored the need to educate younger generations so that they would truly know Tang Teh-chang’s legacy and realize that the park has nothing to do with Sun Yat-sen.
After the memorial service, the crowd visited Tang’s old residence by foot as it was nearby. Then, they returned to the park for a closing prayer delivered by PCT Church and Society Committee Secretary Huang Che-yen.